I mentioned recently that I've found a new favourite painting spot. It's a farm, less than 10 minutes from home, with a history dating back to the late 1800s. I've been given permission to do some painting around the property and have spent quite a lot of time out there over the last week and have taken a lot of photos since the weather has been less-than-forgiving and mostly not suited to painting outdoors. So far, I've managed to paint five times, and it's rained on three of those occasions. 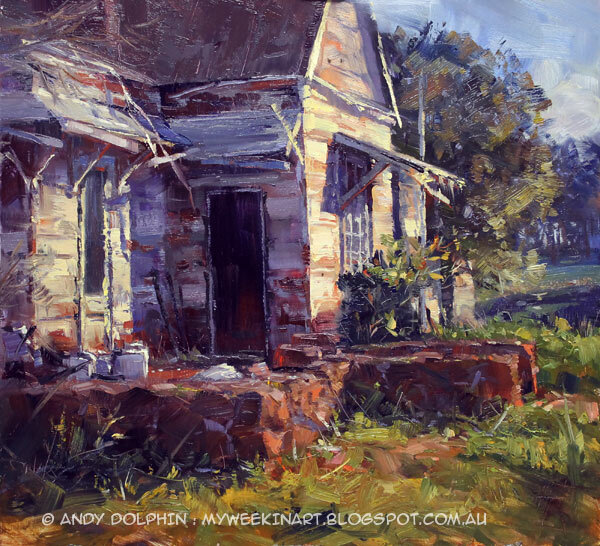 On my first visit, I wandered around an old, derelict cottage and was captivated by its sunlit eastern face. I photographed it and studied the photos over the last week. I even did a rough Photoshop sketch of it. 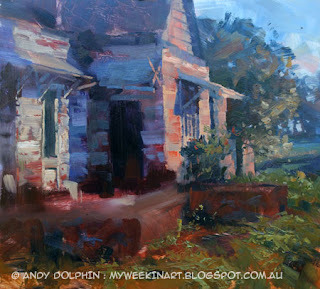 Today we had clear skies again, so I headed out to the farm knowing exactly what I planned to paint. 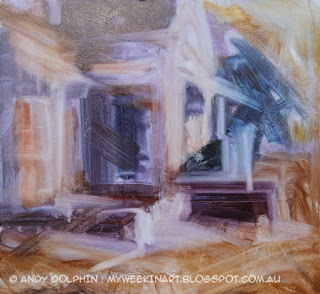 It was time to test my "contemporary impressionism" skills again. Plein air. 38x35cm oil on board. At 38x35cm, this is probably the second-biggest plain air painting I've ever done and, at somewhere between 3.5-4 hours to complete, it took the longest, by far. I don't think it's finished yet, though. This is a combination of washing-in and wiping-out. Although the idea is to keep things fairly loose, a lot of important questions are asked at this stage. Where are the major darks? What's warm, what's cool? Is it too centred, too high, too low? Why do people say painting is relaxing? Should I have taken up golf instead? The questions just keep coming – the same questions, every time. Some remain unanswered. There's 15-30 minutes work here. By this time, the sun had risen pretty high and shifted across to the left, so the shadows had all changed. It was important to try and stick with my layout and not be tempted by what I was seeing in front of me. By the time I finished, the sun had moved far enough that none of these walls were sunlit. Ordinarily, a thumbnail sketch is a useful reference for dealing with the changing-shadows problem but, in this case, I'd had the image stuck in my head for a week, so I didn't do a thumbnail. 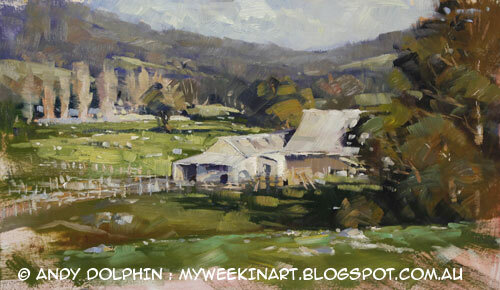 I used the palette knife quite a bit in this painting - for adding and removing paint. That's a whole new world for me. Until this week, I've usually only used a palette knife for mixing paint or, more often, cleaning my brushes - or, sometimes, deleting sections of paintings, or deleting entire paintings. I still have to tame the knife, but this property will offer me a lot of opportunities. Plein air sketch. 34x30cm oil on board. There's just less than an hour's work here, and much of that time was spent on the two sheds. Actually, most of it was probably spent on the white shearing shed. So many shades of "white"! When I put the brushes down, the sun had set and the entire scene was in shadow. But when I turned around, the sky was a brilliant orange-violet. Five minutes later, it was all gone. It was great to have a day with mostly-clear skies. Both are lovely, Andrew. I especially like the stone work on the first.